The long continuance of the unprecedented heat wave in New South Wales is proving a very serious matter to the residents in some of the districts, especially in the western portion of the colony. Over 125 deaths from heat apoplexy have occurred In NewSouth Wales, and to this number Bourke has already contributed 40. The matter has become so serious that the railway authorities have commenced running trains at special cheap fares, to enable the residents to seek a cooler climate, and a great number are availing themselves of the opportunity. CO2 at the time was 290 parts per million. TWENTY more deaths from the terrific heat that is sweeping the South were reported from country towns in New South Wales yesterday, and there were two more in Victoria. Bringing the toll for the Southern heat wave to 52. Two deaths in Thargomindah also have been attributed to the heat. In New South Wales alone 41 have died in the last three days. All temperature records in Melbourne went, by the board yesterday when a maximum of 114.1 deg. was registered — the highest ever experienced in the State. 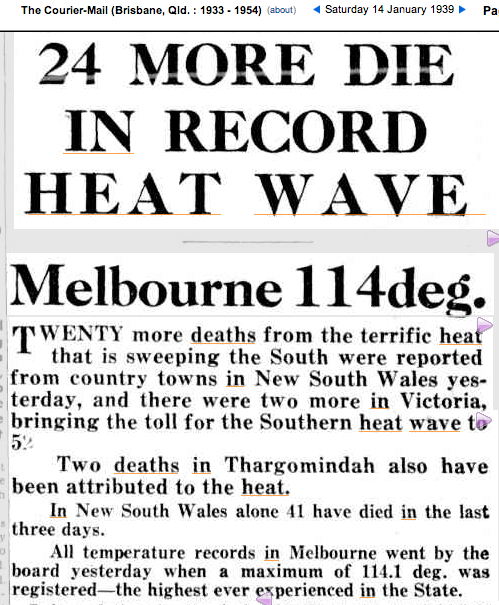 14 Jan 1939 – 24 MORE DIE IN RECORD HEAT WAVE Melbourne 114deg. CO2 at the time was 310 parts per million. 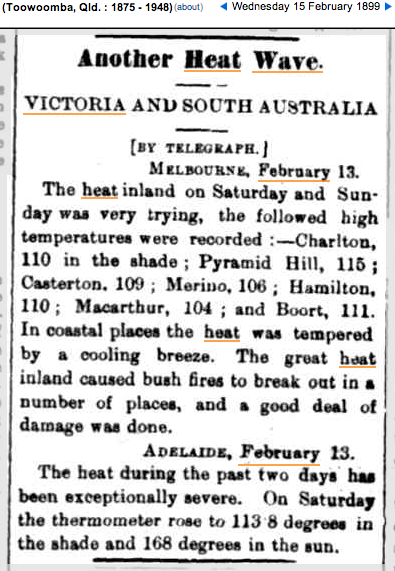 The heat inland on Saturday and Sunday was very trying, the followed high temperatures were recorded :—Charlton, 110 in the shade; Pyramid Bill, 116; Casterton. 109; Merino, 106 ; Hamilton,110; Macarthur, 101; and Boort, 111. In coastal places the heat was tempered by a cooling breeze. The great heat inland caused bosh fires to break oat in a number of places, and a good deal of damage was done. CO2 at the time was 280 parts per million. The city was enveloped in smoke today from, the bush fires which are raging a few miles out of the metropolis. A destructive bush fire is raging at Mansfield. An immense amount of damage has been done on one run, whereabout 3,000 sheep were roasted and millions of rabbits have been destroyed. 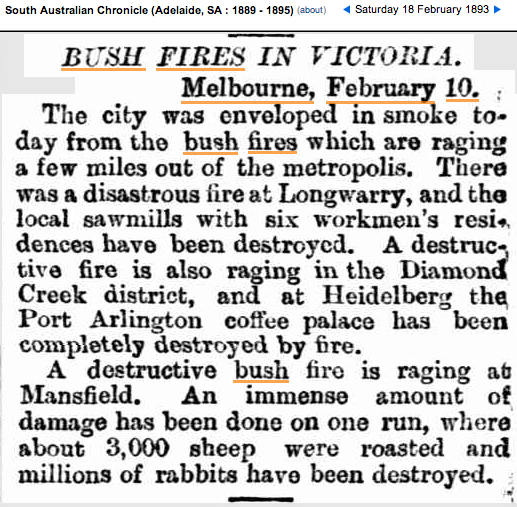 18 Feb 1893 – BUSH FIRES IN VICTORIA. Melbourne, February 10.